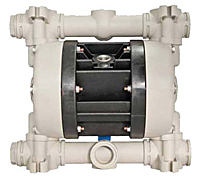 Debem Air Operated Liquid diaphragm pumps are characterized by exceptional performance, power and strength, making them ideal for pumping liquids with very high apparent viscosity up to 50000 cps (at 20°C), even if containing suspended solids. The stall-prevention pneumatic system assures safe pump running and does not require lubricated air. Self-priming dry capacity even with considerable suction head, fine tuning of speed without pressure loss, and the possibility of dry operation without suffering damage mean that these pumps offer unrivaled versatility. In addition, the huge choice of construction materials allows selection of optimum chemical compatibility with the fluid and/or environment without neglecting the temperature range. They are specifically designed for demanding applications with high humidity or in potentially explosive atmospheres (ATEX certification).